By Sean Jones: David Lemieux (38-3, 33 KOs) could take Gennady “GGG” Golovkin’s place for a fight against Saul “Canelo” Alvarez in early 2018 if he beats WBO middleweight champion Billy Joe Saunders (25-0, 12 KOs) in a decisive manner on December 16, according to Golden Boy Promotions CEO Oscar De La Hoya. A week ago, De La Hoya said that his main goal is to try his best to make the rematch between Canelo and Golovkin, but he said that Lemieux would be “another option” for Canelo if he beats Saunders in a convincing manner. “Told by Oscar De La Hoya, while he wants first to make the GGG rematch for Canelo, a convincing Lemieux win is ‘another option,’” said Lance Pugmire of the LA Times. With the Canelo-GGG rematch still not having been made, it would seem that De La Hoya and Golden Boy Promotions are going to sit back and see what happens with the Saunders vs. Lemieux fight on December 16. Saunders and Lemieux will be fighting on HBO Championship Boxing at the Place Bell in Laval, in Quebec, Canada. De La Hoya co-promotes the 28-year-old Lemieux, so it makes all the sense in the world for him to put together a fight between him and Canelo. It would give Golden Boy leverage to potentially squeeze Triple G to have him take less money for the Canelo rematch. De La Hoya will look to make a business move to use Lemieux as a pawn to make a variety of moves that will put Golovkin at a disadvantage. Golovkin can’t really do much. If Golden Boy and Canelo decide they want to age him more or exert pressure on him to take less money than he deserves, he’s not in the position to anything about it. Now that Lemieux is in the background about to win the WBO middleweight title from the light hitting Saunders, it puts Canelo and De La Hoya in a great position to make Golovkin sit and age while they go in another direction. •	Golovkin can be AGED more if Canelo makes him wait for the rematch. The 35-year-old Golovkin already had to wait 2 years to get the Canelo fight. Golovkin looked a lot better 2 years ago at 33 than he is now at 35. By making Golovkin wait 2 year for the Canelo fight, Golden Boy was able to get him in a slightly more deteriorated state than if they’d made the fight in 2015, when he was knocking everyone out. Canelo still appeared to lose to Golovkin by a 9 rounds to 3 score in the scoring by Boxing News 24, as well as Paulie Malignaggi, but he at least survived to go the full 12 rounds so that he could get a controversial 12 round draw. Had Golden Boy not aged Golovkin by making him wait needlessly for 2 years for the Canelo fight, he probably would have knocked the Mexican star out in 3 rounds or less. •	Canelo has opportunity to win the WBO belt from Lemieux BEFORE he faces Golovkin in a rematch. Canelo vs. GGG in a unification fight makes it potentially a bigger rematch than it would be if Canelo were just the challenger again. In the meantime, Golovkin would be under tremendous pressure to take a risky fight against his World Boxing Council mandatory challenger Jermall Charlo. If Canelo faces Lemieux on May 5, then the WBC will likely order Golovkin to face Charlo. That’s a dangerous fight if Golovkin doesn’t let his hands go. He’s not going to beat Jermall by just jabbing like he’s done in his last 2 fights against Canelo and Danny Jacobs. Golovkin will need to fight Charlo, because he’ll bomb him all night long with right hands. Charlo, 6’0”, has the height, reach, hand speed, power and most importantly, the pure courage to try and KO Golovkin. Charlo won’t fight Golovkin in a timid, safety-first manner that we saw from Canelo on September 16. So, it works out for Golden Boy if Canelo fights Lemieux next, because it leaves Golovkin needing to take the much more dangerous fight against Charlo. I don’t think Canelo would be able to survive the distance against Charlo no matter how much running he does. Charlo will get to Canelo and bounce a big shot off his chin to put him down for the count. It would still be risky for Canelo to fight Lemieux, because this is a fight he could lose if the Canadian fighter goes after him to force him to fight the way Liam Smith did last year in September. Smith landed some huge shots on Canelo. He just didn’t have the power to take him out. Lemieux does. If he can connect on the kind of shots that Smith was landing on Canelo, it’s going to be hard for the Golden Boy star to go the full distance. 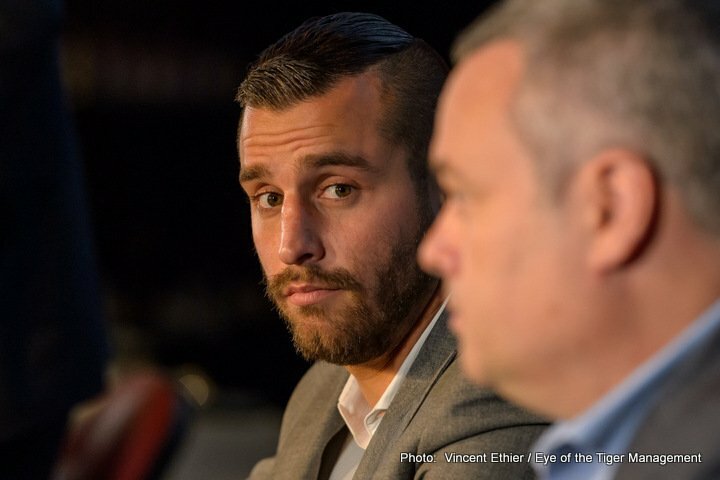 Lemieux should be able to get past Saunders on December 16 to win the WBO middleweight title. Saunders is very likely going to be clinching and running all night long. Saunders definitely won’t be punching with Lemieux because he doesn’t have the power, and he won’t want to take the risks. Saunders will have to show fire in this fight for him to beat Lemieux. The Saunders that we’ve seen lately will be easy prey for the shark-like Lemieux. This is going to be too easy for Lemieux. Saunders has lost a significant amount of his game in the last 2 years with him getting so heavy in between fights. It’s becoming increasingly more difficult for Saunders to lose the weight and fight at a high level. I don’t think Saunders can fight at a high level at middleweight any longer. He needs to move up I weight to 168.